TweakNow PowerPack is a fully-integrated suite of utilities that let you fine-tune every aspect of your computer’s operating system and Web browser. The Registry Cleaner module provides you with a safe and simple way to clean Windows Registry. To keep your computer always at top performance, we recommend to clean your registry at least once a month. 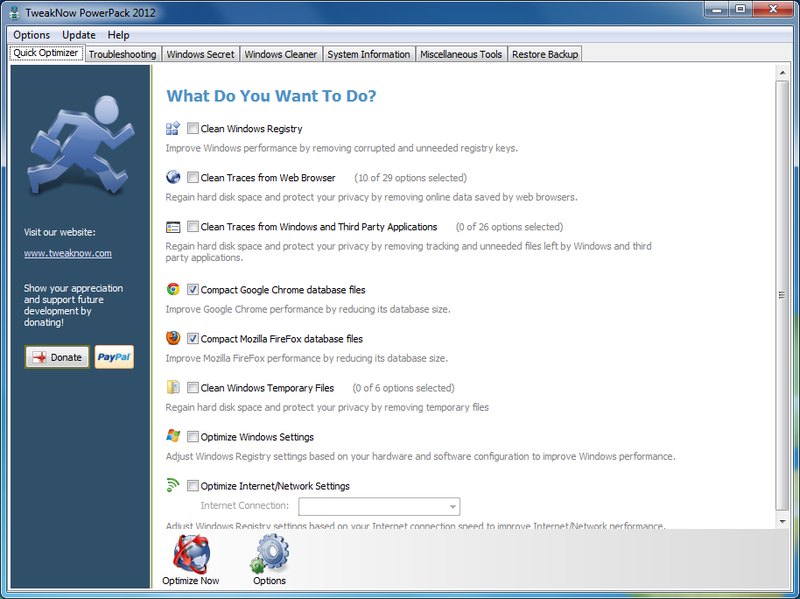 For Windows tweaking lovers, the suite provides more than 100 hidden Windows settings in the Windows Secret section. Using modules included in this section, you can easily customize your Windows like geeks do. The Virtual Desktop program lets you run as many as four custom-designed desktop configurations simultaneously, allowing you to tailor your computer screen to your mood and your work requirements. The RAM Idle program manages the free memory that is available to run Windows programs. It prevents performance from degrading as you swap files and programs in and out of memory. The AutoShutdown program lets you suspend, hibernate, or shut down your computer after a specified period of time. In addition to saving resources, this program keeps your system more secure by making it unavailable to unauthorized people. The CD AutoRun is an extension of Windows’ CD and DVD autorun features, giving you additional options for starting programs or listening to music. The TweakNow PowerPack suite gives you a complete picture of all aspects of your computer’s hardware, including detailed information about your motherboard, processor, video card, memory, hard disk and network. Supported Operating Systems: Windows XP, Vista, Windows 7, Windows 8/ 8.1, Windows 10.